Anatomy of a Disappearance is Hisham Matar's second novel. Nuri is filled with a lot of emptiness when his mother passes away. This is until he meets Mona while he and his father, Kamal, are on holiday in Alexandria at the Magda Marina hotel. Nuri becomes infatuated with Mona, but Mona falls in love with his father, and they eventually marry. Unhappy about his father's new found love and happiness with Mona, Nuri wishes for his father to disappear. But you know what they say, be careful what you wish for. As shortly after he starts boarding school at the age of 14 in London, his father is abducted and never seen again. Now Nuri and Mona have to come to terms with the disappearance of Kamal and over the next 11 years they also begin to learn more about Kamal and the secrets he had. While all that is going on, there is also a really weird love triangle involving Nuri, Mona and Kamal and when Kamal disappears, this weird sexual tension between Nuri and Mona still exists. Over the years, after the disappearance, the relationship changes but I was really intrigued by this disturbing sexual, step-mother/step-son relationship. 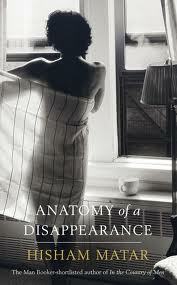 Anatomy of a Disappearance is also filled with a lot of secrecy. Even when we discover a few towards the end of the book, there is still a lot that is left unsaid. Like what did his mother die of, what exactly was his father involved in (yes, we knew he was living in exile with his family in Cairo but what did he do because even when Nuri was asked in boarding school by his German roommate what his father's job was he wasn't quite sure), and what really happened to his dad? Even Nuri's life in the boarding school was really very vague. Despite so many unanswered questions, Hisham Matar writes so beautifully. Each page is filled with emotions and intimacy and you feel Nuri's pain - his longing, his desires, his confusion, his loneliness, his unease. I have no idea what it would feel like to lose a loved one but in Anatomy of Disappearance you get an idea of how one copes with such loss. It seems like you are on auto-pilot, doing things to occupy yourself but still always having the memory of your loved ones in the back of your mind. It's also interesting to see how one grows up considering by the time he was 14 Nuri had lost both of his parents. The truth is the novel captures some of life's complexities - sometimes you can't get all the answers. This is a son trying to come to terms with loss of his parents. I also found out after I finished reading the book that Hisham Matar's father also disappeared when he was younger, which could quite possibly add to the complexity of Nuri's thoughts and experiences of loss. It's a beautifully written book, and despite its complexity it's a really quick and easy read. I read it in one sitting. It was written in a way that I always wanted to find out what was going to happen next. Although I didn't get all the answers, I still very much enjoyed reading it and now I am definitely looking forward to reading In the Country of Men. Anatomy of a Disappearance has also been reviewed as part of the Africa Reading Challenge. I think I remember hearing about this book before. It sounds really interesting and different. Knowing he was 14 when his father disappeared and there was sexual tension between he and his step-mother at that time is a bit odd though. It is different. I don't think I've read anything like it before. The sexual tension is also really weird, especially as sometimes it feels like the step-mother knows how Nuri feels and encourages it.